This is an excellent picture of Audrey Berdar and I love her caption: “Get out there & enjoy the ride”. I totally skateboard for fun, and while I work and hope to be a better skater, my happiness is not dependent on my skill level. I also believe that no matter what you’re wearing you look better when you’re smiling. 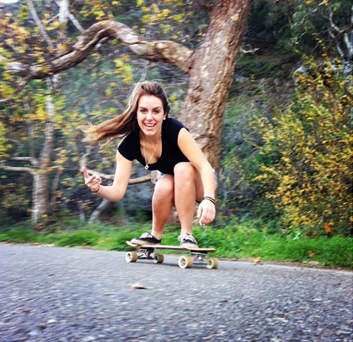 Keep sharing those pictures of having fun skating – they are after all the most fashionable pictures and what will inspire other girls to give skate boarding a try. Previous PostSkateboarding Ring 4 St. Patrick’s DayNext PostSkateboarding Improves School Work?